Currently, 49 percent — or nearly half — of surveyed consumers learn about food through social networks, and 9 percent have downloaded a mobile food app in the past year. From tweeting about the delectable belgian waffle they just ate and discovering recipes on image-centric cooking blogs to checking into the hottest new restaurants, more food-obsessed people are turning to social media to help satiate their cravings. Are We In A Social Media Tech Bubble? The economy is not in a good place, but some technology companies are being valued higher than ever. This motion graphic done with What’s Trending, takes a look at whether or not we are heading for another tech bubble burst, or if social media companies — Facebook and Linked In — are really worth what they are being traded for. The list of the world’s CEOs regularly includes celebrities, billionaires, big egos, risk takers, and failures. What it does not include are social media experts; but that’s about to change. 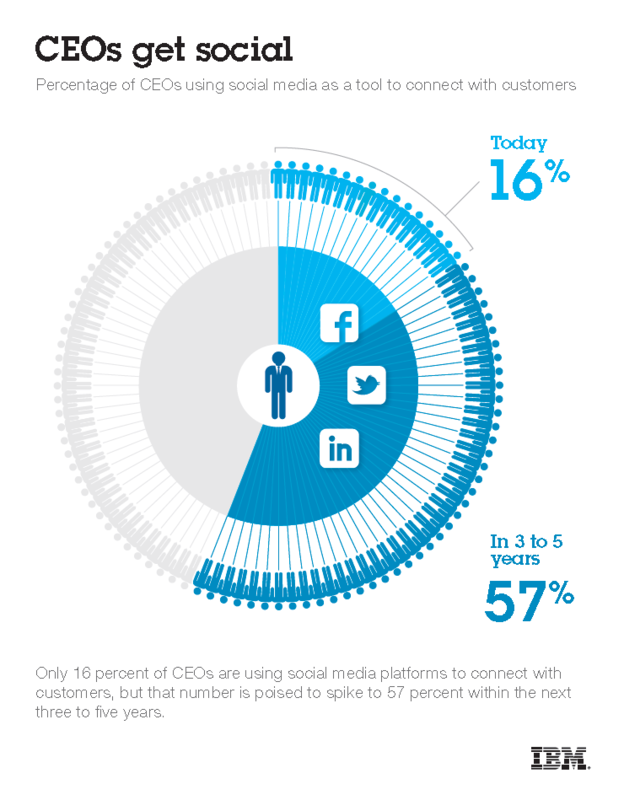 When IBM (NYSE: IBM) conducted its study of 1709 CEOs around the world, they found only 16% of them participating in social media. But their analysis shows that the percentage will likely grow to 57% within 5 years. Why? because CEOs are beginning to recognize that using email and the phone to get the message out isn’t sufficient anymore. The big takeaway: That using social technologies to engage with customers, suppliers and employees will enable the organization to be more adaptive and agile. collaborators, and innovate,” the IBM study concluded. Simply put, CEOs and their executives set the cultural tone for an organization. Through participation, they implicitly promote the use of social technologies. That will make their organizations more competitive and better able to adapt to sudden market changes. The study reveals that CEOs are changing the nature of work by adding a powerful dose of openness, transparency and employee empowerment to the command-and-control ethos that has characterized the modern corporation for more than a century. Companies that outperform their peers are 30 percent more likely to identify openness – often characterized by a greater use of social media as a key enabler of collaboration and innovation – as a key influence on their organization. 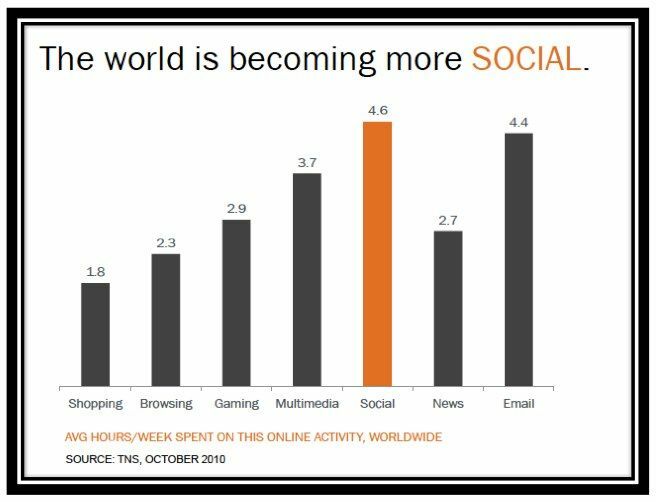 While social media is the least utilized of all customer interaction methods today, it stands to become the number two organizational engagement method within the next five years, a close second to face-to-face interactions. More than half of CEOs (53 percent) are planning to use technology to facilitate greater partnering and collaboration with outside organizations, while 52 percent are shifting their attention to promoting great internal collaboration. Championing collaborative innovation is not something CEOs are delegating to their HR leaders. According to the study findings, the business executives are interested in leading by example. CEOs regard interpersonal skills of collaboration (75 percent), communication (67 percent), creativity (61 percent) and flexibility (61 percent) as key drivers of employee success to operate in a more complex, interconnected environment. The trend toward greater collaboration extends beyond the corporation to external partnering relationships. Partnering is now at an all-time high. In 2008, slightly more than half of the CEOs IBM interviewed planned to partner extensively. Now, more than two-thirds intend to do so. CEOs are most focused on gaining insights into their customers. Seventy-three percent of CEOs are making significant investments in their organizations’ ability to draw meaningful customer insights from available data. I’ve often held IBM as the best example of a Social Business and a company to emulate rather than Apple. I believe this study and the analysis behind it, reinforces that view. The IBM study shows that CEOs and the companies they manage must constantly evolve to stay competitive. Partners, suppliers, employees and customers want CEOs to communicate with them on a personal level to build trust and to help align them to the organization’s strategy. There is a lot at stake here. And if CEOs continue to hide in their Ivory Towers under the guise of some old command and control mentality, the next chapter in their career might be written somewhere else. SINGAPORE–IBM signed a memorandum of understanding (MOU) with the National University of Singapore’s Institute of Systems Science (NUS-ISS) to set up its first ever Center of Excellence (CoE) for enterprise social business here. This would help bring up Asia’s level of social business adoption to match that of Europe and the United States, one executive says. Lim Swee Cheang, director of NUS-ISS, said the CoE will be operational in May this year, and will target local senior business executives to educate them on the benefits of tapping on social technologies within their organizations. The Center’s goal will be to help companies here evolve into social businesses by advising them on the roadmap and strategy, as well as conduct research on the topic, added Christopher Chia, chairman of the NUS-ISS management board. Both executives spoke during a press briefing held in conjunction with IBM’s Business Gets Social 2012 event on Wednesday. Both parties declined to reveal how much was invested to establish the CoE, though. In terms of content, the CoE will offer two courses initially, said Lim. These include a half-day seminar on the benefits of social business, as well as a two-day course meant for companies interested in implementing social technologies. The longer course can also be customized for specific businesses as each organization would have its particular needs, he added. The director said the “cautious” initial estimate for enrolment is between 100 and 300 participants for the first year. However, the Center may open up free courses to provide for more participants if the need arises, he said. Lum Seow Khun, business unit executive of ISV (independent software vendor) and developer relations at IBM Singapore, added the company plans to conduct one session per quarter in the beginning and increase the frequency based on take-up rate. She added both parties would co-conduct the lectures, and IBM will provide free software and course ware. Sandy Carter, vice president of social business sales and evangelism at IBM, pointed out that with social media expected to create more jobs than the Internet did, it is good for those in Singapore to be trained early in social business. The executive, who was a keynote speaker at the event, also said that while the region’s adoption of social business is slightly behind that of Europe, which leads the pack, and the United States, companies here are “ripe to catch up” due to the high personal social media usage. This is because users will look to bring social technologies they use frequently into the enterprise arena, she explained. Indonesian restaurant chain Bumbu Desa, for one, has adopted Big Blue’s SmartCloud Connections collaboration tools to enable franchise holder to discuss store strategies on a single platform, noted Christopher Blake, Asean regional executive for collaboration solutions at IBM, during the briefing. Besides internal collaboration, the platform can also be opened to external parties such as food critics to join in the conversation, he added. Zooming in on Singapore, Carter cited a 2011 study conducted by a GlobalWebIndex that ranked the city-state’s social network penetration higher than the global average. Additionally, users here have moved beyond using social media for personal communication and on to creating online communities. These factors mark Singapore out as having the potential to be a proponent for social business, she said. 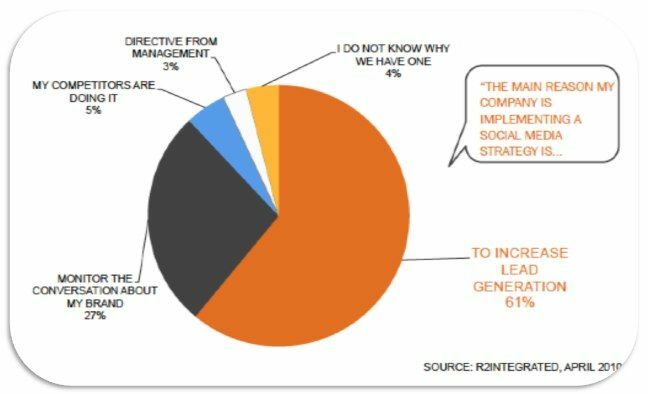 63% of companies using social media say it has increased marketing effectiveness—among other benefits. 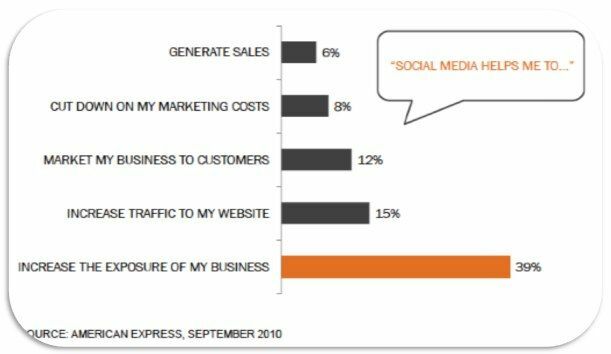 More than 1/3 of companies say social media helps them get found online. BOTTOM LINE : It’s time to go social. With such a varied choice of social media platforms to choose from, its sometimes difficult to know where to make the most of social media. It’s more complicated than just posting status updates at random and seeing what sticks. When is Facebook most effective? 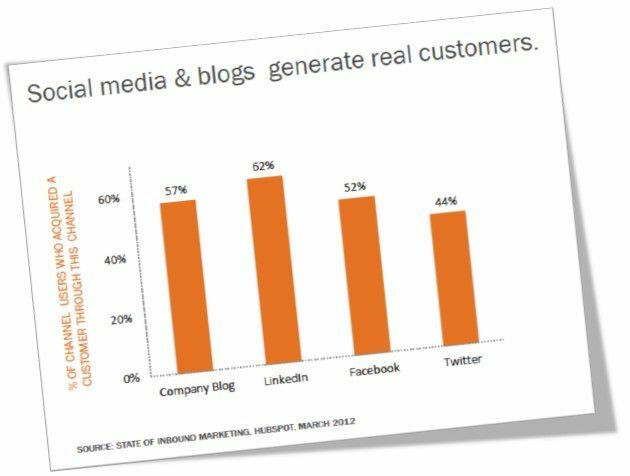 When are you better off using Twitter, or LinkedIn? And what exactly is Google+ good for, anyway? The business consultant network Zintro recently pulled research from more than a dozen sources including Mashable, Facebook, Twitter, LinkedIn, Google and Quantcast to put together this nifty infographic, which will help you develop your social strategy. Check it out below for the full report. Do you use different social networks for different purposes? Let us know in the comments. LinkedIn to many is seen as a recruitment portal. The place to be to get headhunted into that dream job. I have yet to be blessed with that experience. To me, LinkedIn was kind of … well, boring. If Facebook is the street party, LinkedIn is a stuffy reception with piped-in music at one of those soulless function facilities. Does that sound harsh? For sure. If your thinking the same, let me tell you, you couldn’t be more wrong. 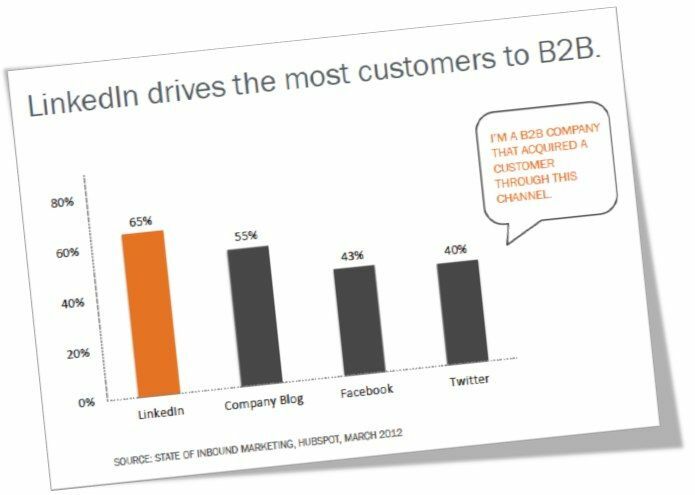 While the early adopters flock to Google+ and our kids and moms become power-users on Facebook, LinkedIn is where business gets done. Execs from all Fortune 500 companies are there, and 59 percent of those active on social networking sites sites say LinkedIn is their platform of choice over Facebook or Twitter, up from 41 percent who called LinkedIn their most important social account a year earlier, according to a June report by Performics and ROI Research. LinkedIn, it turns out, is a happening place. As of this spring, it has more than 150 million members in more than 200 countries, on all seven continents. LinkedIn adds around 10 new members every 5 seconds. 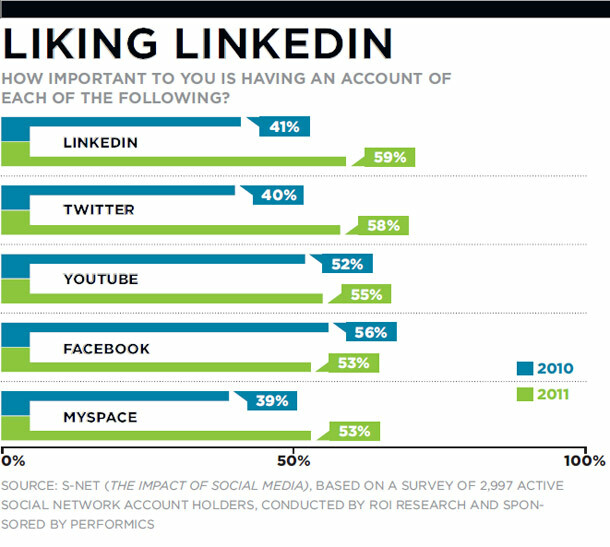 All of this adds up to making LinkedIn the dark horse in social networking. Or the “unsung hero” of the social platforms. There will –as suspected– an awful lot of job searching going on at LinkedIn. But there’s much more going on over there, too. 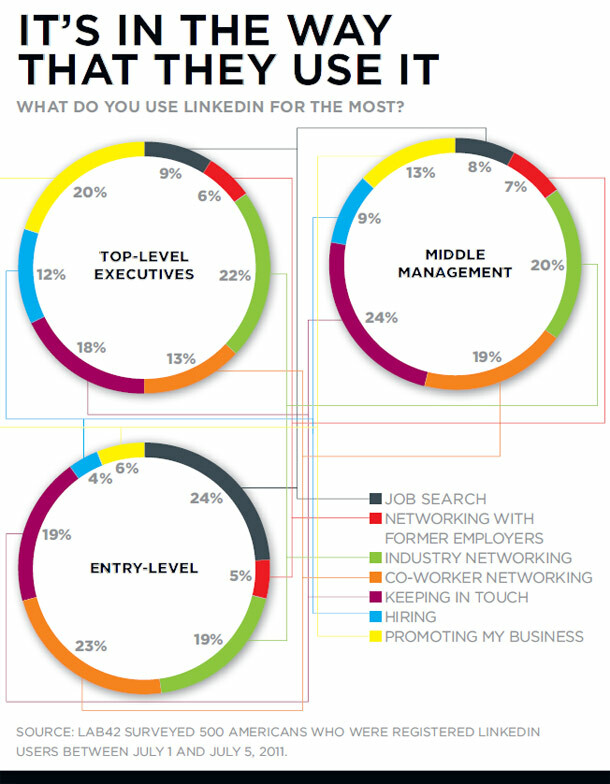 I have seen that top-level executives and entry-level workers use LinkedIn differently: Younger members use the site mostly to post résumés and network for jobs, while more experienced professionals use it to demonstrate thought leadership and expertise, promote their businesses, conduct market research and–perhaps most important–win new business. So how might companies use it to win new business, specifically? Target searches for keywords you’ve identified as central to your business. Target specific roles ie: “Director of Technology” specific post codes and company names to identify key contacts to call, e-mail, InMail (send a message via LinkedIn’s internal messaging system) or forward a hard copy information. Track who is looking at your profile and your staff’s profiles. Understand what searches you are appearing in and perhaps strengthen your profile to appear in more. Reach out to those who stopped by “how can I help”. Research, or as I call it “social sleuthing’ others call it stalking, but there is a law against that now! Set up a company page. Setting up your business as a “company” on LinkedIn can if you do it right, generate a bunch of leads, as well as it give you an opportunity to have a presence on LinkedIn beyond a personal profile to ratchet up your company’s charisma. I like the way you can embed banner images and videos in your company page, as well as feed your blog posts and tweets. You can also feature your products on your page and seek recommendations for them. That’s a kind of social proof that only enhances your credibility. Discern patterns. Notice who’s connected in your industry. Noting that an individual is suddenly connected to several execs at a single company may indicate that the company is open to dialogue. “Which suggests to me that I might want to get my brand (me) in front of them”. Participate in LinkedIn groups catering to your target market in order to engage in conversations with the right people. Seek out groups with lots of activity rather than simply lots of members. (You’ll have to join them to get a sense of the activity.) Monitor each group’s discussion posts and respond thoughtfully with content rather than a pitch. The goal is to engage rather than sell outright. is “you’re not on the clock now you know”. But you know what, I love what I do. dont know, about topics we have an interest in. I feel engaged. networks can provide. But you get the drift. 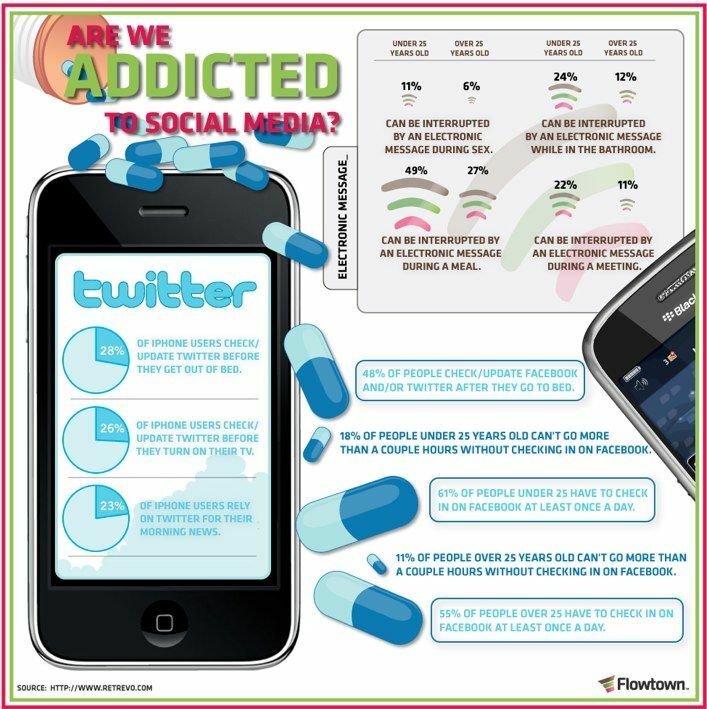 I shouldn’t have been surprised when I Googled social addiction, that the images it provided depicted the worst meaning of addiction mixed with the brand names of social networks, but I was. All very negative connotations. However I did find this infographic. So I can even understand why people are hesitance to get into social media. It can, if you let it, get quite involved. But and this is a big but, what I get from helping people I dont even know personally and being recommended as a resource to others is a fantastic feeling. My personal recommendations are figure out what you want to achieve first. If its personal branding then think LinkedIn, Blogs and Twitter,. If is marketing a brand then Facebook, Twitter, Pinterest or Blogs. If its sales then you need to think both, why, because people buy from people. You are now being a marketeer as well as a sales person. Believe me once you have done the set up work, it gets easier! Like I said lyrically barren!! 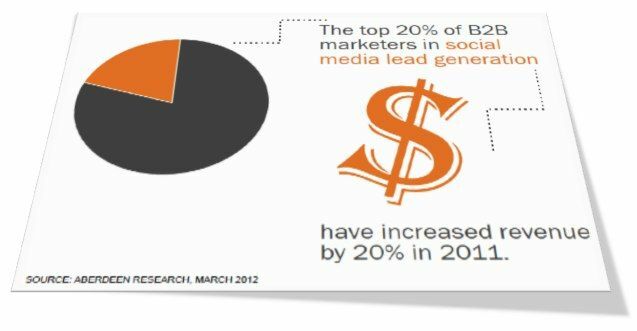 There is a great deal of interest and many different answers to the age old “what is the ROI of social media?”. To date I have not seen a definitive answer to this. The other question I hear is “How do we measure success”, then – “what is the definition of success?” Let me ask you this, do you measure the success of using email, instant messaging or the phone? Why is there this obsession to measure social media when in essence its just another tool, another form of communication that, lets face it, is meteroic. 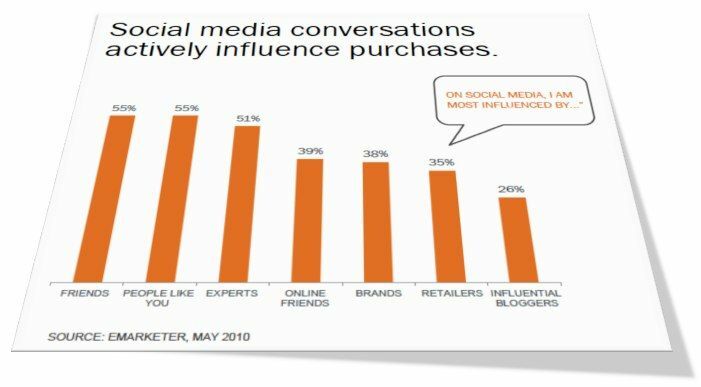 Yesterday Brian Solis, Principal Analyst from Altimeter released a report – The Rise of Digital Influence. A fasinating read if you have time. Link is further down. Here are some of the highlights, I found interesting. Pillar 3: Resonance: The sum of the above, frequency, period and amplitude. Now lets take a look at an action plan. 1) Benchmark: Understand where you are now so that you can track progress caputring sentiment, behaviour and awareness. 3) Strategy: Develop a strategy that connects the dots between you, connected consumers, and their communities. TwitterGrader compares Twitter profiles to millions of other users already indexed to establish a score between 1–100. Use Case: TwitterGrader is a performance metric for handles in comparison to other accounts. It’s ideal for quick one-to-one analysis when new, potentially influential individuals are identified using other services. 40 different elements to quantify the varying importance of individuals using Twitter based on the context of their online activity. Use Case: These services are purpose-built tools for the PR and marketing teams that give actionable insight into which people are influential within the right context in the right platform. PR teams can use the export feature to embed influence lists into their campaigns. These tools also offer insights into influential voices during crisis management. TweetReach provides insight into the reach and exposure of a tweet or Twitter campaign. The service tracks any topic on Twitter and measures its exposure, activity, and contributors to identify trends and surface topical influencers. Use Case: TweetReach offers data on the relevance, reach, and resonance of everyday conversations. Studying this information provides organizations with the ability to benchmark activity, benchmark against competitive activity, and also monitor the experiences of relevant individuals for later engagement. EmpireAvenue.com is a virtual stock market that trades on the social capital of personal brands and real-world brands alike. increased engagement within EmpireAvenue, as well as in their specific channels directly. retweets, replies, likes, new follows, and other actions. Use Case: Gathering intelligence around communities of focus and interest graphs. Using the self-service dashboard, businesses can learn more about the people and their earned social capital related to key topics. It offers a glimpse of reach and authority based on individual activity and the related activity of those around them. PeerIndex provides an overview of an individual’s stature, relevance, and reach within social networks based on cumulative activity. Sources include Twitter, Facebook, LinkedIn, Quora, and blogs. 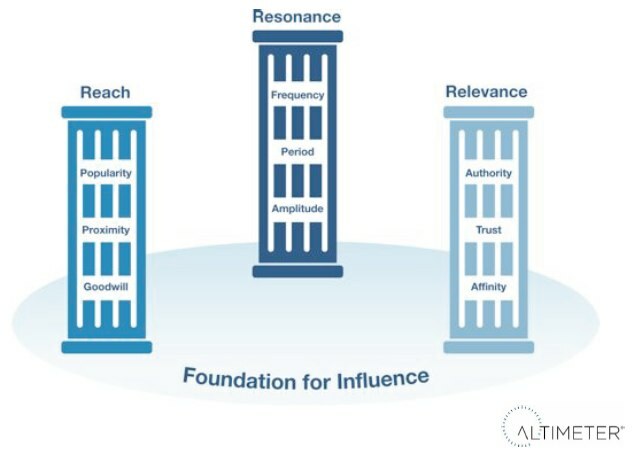 PeerIndex consists of four components: resonance, authority, activity, and audience. Use Case: The PeerPerks program is a marketing program that delivers scalable word of mouth and rewards programs. It does so by characterizing what makes a likely socialadvocate for a brand and then helping brands reach and engage many thousands of those advocates at a time. PeerIndex also provides enhanced tools for behavioralprofiling and integration into a range of social platforms for select clients. mPACT is developed by mBlast and is designed for marketing professionals in companies and agencies with an emphasis on identifying the specific individuals who are the established authorities on any given subject. Use Case: Because mPACT’s strength is on topical relevance, the ability to identify connected individuals who matter to your market is revealing and insightful. Running a search by the keywords that define your industry will introduce you to the most relevant people who are already talking about your space, with or without you. Traackr positions itself as an influencer discovery and monitoring platform. It uses a proprietary search engine and scoring algorithm to convert any keyword query into a list of top influencers ranked on the Reach, Resonance, and Relevance of each person discovered in the search. Use Case: Traackr is dedicated to influencer identification and engagement. Focusing on communications rather than rewards, Traacker will help businesses create and manage ambassador programs and also shape influencer relations campaigns. Users can also track mentions and engagement metrics. Radian6 developed an Influencer widget as part of its listening and engagement platform, which helps brands identify important individuals related to their markets across a myriad of social platforms, including blogs and Twitter. Appinions is an influencer management platform, which is the result of over a decade of technology development at Cornell University. The platform is based on two key pillars: technology and access. Use Case: Intended for agencies and brands, Appinions is designed to identify relevant influencers for intelligence gathering and engagement and is used by social out-reach, PR, strategy, and research teams. 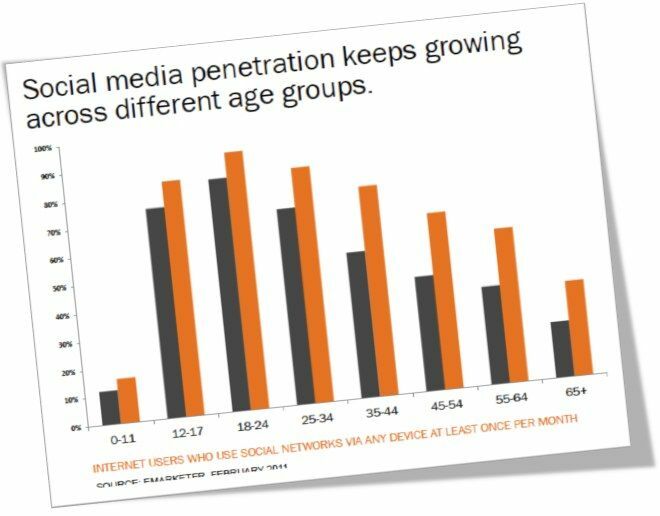 Klout uses over 50 variables to measure what it calls the “standard for influence.” Its public-facing service presents the social capital and capacity for an individual’s ability to influence behavior and outcomes in social networks. Klout’s algorithm involves three separate stages of semantic calculation: True Reach, Amplification Probability, and Network Value. Use Case: Klout offers a free search tool to identify individual ranking by username. To use this tool effectively, brands must first have an idea of who they would like to learn more about and then use the search function to analyze their social capital. Additionally, organizations can partner with Klout through its paid Perks program to target influencers by Reach, Relevance, and/or Relevance. Twitalyzer evaluates Twitter activity based on a deep set of factors to assess signal-tonoise ratio, generosity, velocity, and also clout. Use Case: Twitalyzer offers a detailed Benchmark report that provides brands with ranked lists of Twitter users based on their stated location and the tags that have been applied to their profile. Reviewing this list of potential influencers and analyzing their activity provides brands with insight into the nature of the dialogue, as well as opportunities to engage influencers. eCairn’s Conversation platform was developed to help marketing professionals identify influential communities and the influencers who drive relevant market conversations. Use Case: eCairn is an influencer relationship management solution designed to help brands find and engage with topical influencers and experts.